Many thanks, its so pretty. ziet er ook goed uit. I love this font!! Thank you! OH NO I WAS WRONG I NEED THE B & D. HELP! Some how I missed the D. Can it be put up again please. I have the B for the person who needs it. Can't wait to give this one a try! Thank you . This is beautful. This is such a lovely alphabet! Thanks for sharing it with us. Happy Thanksgiving all!!!! thanks for the letter! THANKS for the Letters. Have a Happy Thanksgiving to all of you. Hi! I need very much the letters ABC, please. Thanks. Missed the letter 'A' because your website wasn't working properly, now the 'E'. Did you have the 'D'? When will you be up and running again? I cannot download for 2 days! What is up with these sites? People have been posting for days about the missing information and it still looks the same. I'm having problems with adorable applique, amazing embroidery and cute embroidery. Can't get the designs at all on adorable and amazing. I get "404 not found" and could get the letters on cute the last 2 days. Message at the top of page says "unexpected downtime: Networking maintenance at our hosting provider. Problems with the site? Cannot download. Did not get the D yesterday or the E today. Site problems? There is no 'E' design with this download. are you having problems with the site>?????? cant download !!!! Спасибо! Мне нравится буква Е! Это моя буква! Why do you propose again the whole berryfont instead of only the letters missed by some members ? Beautiful font. Thanks so much. Thanks for posting the ones again that we missed because life keeps getting in the way... I would love to see the M again. I was sitting vigil at the hospital and missed it the last time. thank you for all your freebies. but somehow i missed e berryfont. can we have a redo please? Thanks for all the awesome designs! Darn I missed the D - Do you think you will rerun it later? Lovely! Now I know what to sew for my friend Elaine's birthday card! 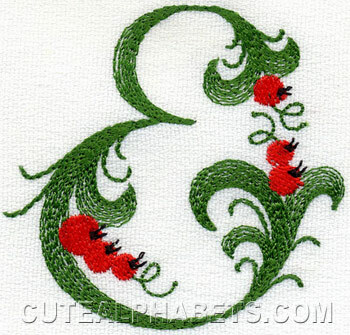 E-ELLEGANT!,EXCELLENT!for EVERY EMBROIDERY! THANKS SO MUCH!! Vielen Dank für das wunderschöne "E"
Especially glad to download that E. Everybody uses an E at one time or another. Thank you! Thanks a lot, it`s beautiful! E is excellent. Thank you. where was D I checked yesterday several times and it still had C then this morning it was a E. need the D redone. Thanks they are beautiful. This alphabet is so lovely! Thank you! Thank you for this E,it is AWESOME!! Infact the whole berryfont alphabet is AWESOME!! E is for Esther, my daughter's name. Thank you for this joyful font. E is for Excellent and so is the alphabet. Thank you for another great alphabet. Another Awesome font! Thanks so much...can't wait for the others!! !